at the northeast corner of Mills & Walter Avenues. The building at the northeast corner of Mills and Walter Avenues began its life as a market house. The exact years of its operation are not known, but based on Sanborn maps, it can be determined that it was not built before 1904 and was not being used as a market by 1917. In fact, that year it was marked as “VACANT – FORMERLY MARKET HO.” However, until 1922, the city directories continued listing it as the Market House. From 1926 to 1929, the Norwood Ice Rink Company was listed at that location. Throughout the 1930’s, it was listed as vacant or not listed at all. From 1940 to 1981, the building was used as an automobile safety lane. The Norwood Market House on Mills Avenue, 1910. Postcard image supplied by Bob Hilvers. 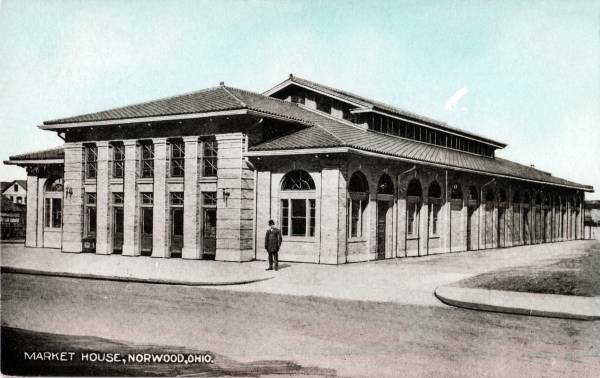 During its operation as the Norwood Market House, Joseph B. Levingood, the marketmaster, allowed grocers from Cincinnati and Norwood to set up booths on either side of an aisle running down the long middle of the building. According to a description of the interior of the market house, on either side of a central lobby were stalls for the vendors selling delicatessen products, meats, vegetables and fruits. While the building was a market house, some Norwood Protestant churches would take turns holding services in the summer evenings. A platform on the east side of the building (facing Montgomery Road) was strung with lights, allowing it to be used as a stage for the preachers. The audience would sit in Victory Park on chairs stored in the Market House. After the market ceased operations, the building was used as a roller rink, a private ice hockey club, and later an ice skating rink operated by the Norwood Ice Rink Company. Between 1940 and its closing on April 17, 1981, the building was used as an automobile safety lane. During that time, your vehicle would have to pass a safety inspection at which time a sticker would be placed on the inside of the front windshield. At the time of the closing, suggestions for use of the building included making it a new police station and jail, returning it to a roller rink or restoring it as a market house. A state license bureau, which operated out of the Walter Avenue side, remained open for a few years until it also closed. In 1982, the building was converted to use as an amateur boxing center for the Norwood Boxing Club and later as a city storage facility. The Williams’ 1902 Norwood Directory listed Elmer Dines, painter, at the northeast corner of Mills and Walter Avenues. The 1904 map showed a 2-story building and a 1-story dwelling at 4514 Walter, at the backside of the later-built Market House, which is at 4500 Walter and 2054-2058 Mills. Maybe Mr. Dines property was taken for the Market House. 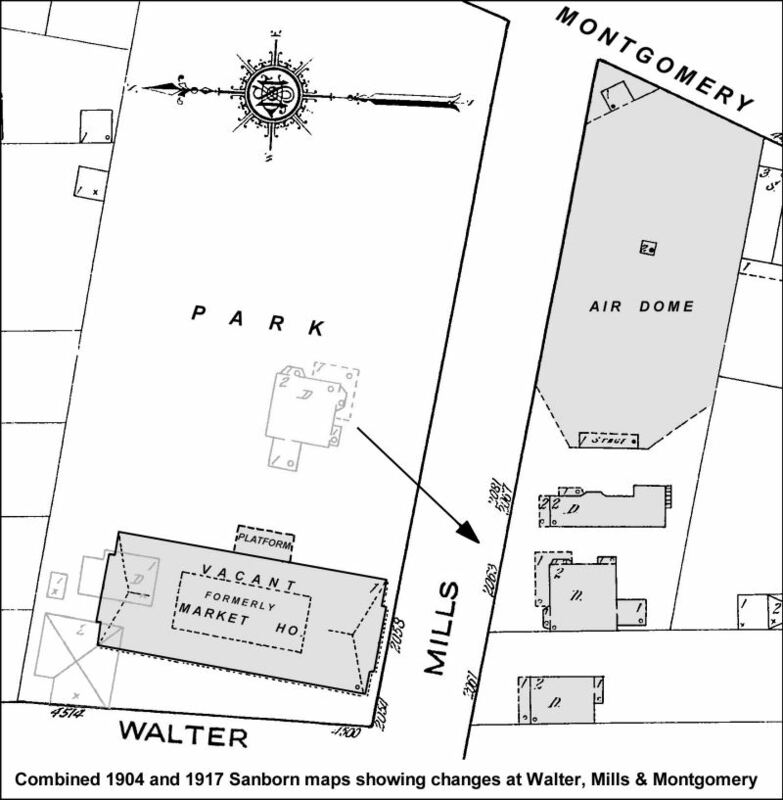 In this composite of the 1904 and 1917 Sanborn maps, the changes in the area at Mills, between Montgomery and Walter are apparent. During some of the years the Market House was in operation, an outdoor theater known as the Plaza Air Dome was showing silent movies for 15 cents (ca. 1912-1920) and two houses opposite the Market House had been built. To accommodate what is Victory Park, the house to the east of the Market House was moved to the south side of Mills. It was originally the home of L. C. Hopkins, a major developer of early Norwood. That building was demolished in recent times for a parking lot.